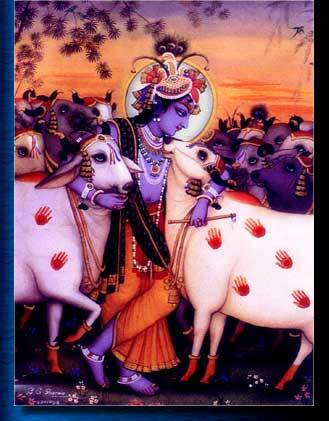 Bhaktivedanta College is a tax exempt 501(c)(3) corporation. What does that mean to you? 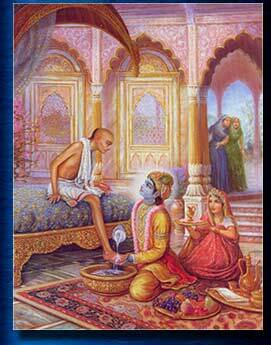 Find out how to make a Bequest to Bhaktivedanta College. The Bhaktivedanta College is trying to follow in the pure Vedic spirit of Brahminical culture. The sastras point out that the duties of the Brahmanas are six fold: Pathana paathana yajana yaajana daana pratigraha. "They should become scholars of the Vedas and they should teach others to become scholars of the Vedas, they should worship God and teach others how to worship, they should accept charity and they should distribute charity." According to Varna-ashrama dharma, the Brahmanas were meant for contemplating the Supreme Personality of Godhead Lord Krsna and teaching this to others. Recognizing this important work, the rest of society would maintain the Brahmanas thus freeing them from financial worries so that they could focus on their mission without anxiety. The Bhaktivedanta College is thus depending upon the rest of society for support in helping us perform our mission. Keeping true to the Vedic tradition, the Bhaktivedanta College is not charging tuition from its students, but rather is simply accepting dakshine (donations) and seva (service). This is a revolutionary step for an academic institution in the West to take. It has only been possible because of the liberal support of our well wishers. We are in urgent need of funds for a special project to digitize rare books, palm leaf manuscripts, and reference books. For this project we require a digital camera like the 16 Megapixel Canon EOS 1Ds Mark II (US $8,000) with a suitable lens, copy stand and accessories. Total cost approximately US $10,000. Video camera and tripod for recording classes. Teacher Support Fund: many of our teachers work on a volunteer basis with little financial remuneration for their efforts, often only taking donations from their students. They must support themselves by other means in order to maintain themselves and their families. This fund would be used to help maintain our teachers so that they can spend their valuable time focusing more on their students and research as opposed to worrying about how to maintain themselves. Land/Building Fund: presently the school does not have its own property or buildings. With suitable funding, we could purchase land and develop a campus. Course Development Fund: it takes anywhere from three months to a year (or longer) to develop an individual course. It takes careful planning and hard work plus money to support the person designing the course. Student Scholarship Fund: this covers living expenses so that students can concentrate fully on their studies without financial anxiety. Presently most students have to work to support themselves and are thus only able to study part-time. Library Fund: Universities and libraries are synonymous and it is no different at the Bhaktivedanta College. Our goal is to develop a large library of Vedic literature in Sanskrit as well as in regional languages like Bengali, and Tamil, as well as Pali and other prakrits. Friends of Bhaktivedanta College: These are the different levels of donors according to their level of contributions. Diamond Level: $50,000 and above. When a donor reaches $50,000 or more in their contributions to Bhaktivedanta College, they are awarded the prestigious Diamond level of donor Friends to the College. Platinum Level: $25,000 and above. When a donor reaches $25,000 or more in their contributions to Bhaktivedanta College, they are awarded the Platinum level of donor Friends to the College. Gold Level: $10,000 and above. When a donor reaches $10,000 up to $24,999 in their contributions to Bhaktivedanta College, they are awarded entrance into the Gold Level of donor Friends to the College. Silver Level: $1,000 up to $9,999. When a donor reaches $1,000 and up to $9,999 in their contributions to Bhaktivedanta College, they are awarded entrance into the Silver Level of donor Friends to the College. This donor gives monthly donations to the college to support the College's activities, or has contributed $100 or more to the College. Example $31.00 a month = $372.00 annually. These donors are recognized as Bronze Level Friends to the college. At this time the Bhaktivedanta College would like to express it thanks to Sriman Vikas Sharma for his ongoing financial support over the years. This is the most precious jewel of a gift that you could give. Do you have expertise in: education, fund raising for educational institutions, teaching, etc.? Do you have ideas on how we could fulfill the objectives of the Bhaktivedanta College and are willing to put your time into it? Go to Service Opportunities and see if there is anything there that appeals to you. for their invaluable help in maintaining our web site and server.